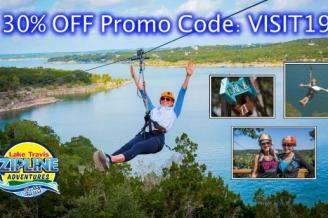 Nature Lovers meet Thrill Seekers at Lake Travis Zipline Adventures. Austin's newest and most exciting outdoor adventure with 5 pulse pounding zip lines. Come experience the Longest zip line in Texas and the 9th longest in the World! Your 3 hour Adventure includes a short boat ride, 5 zips ranging from 250 ft to over 2,600 ft long. Your zipline tour package includes a full day pass at our private lake front park where you can swim, play games or just relax and enjoy the beautiful scenery.